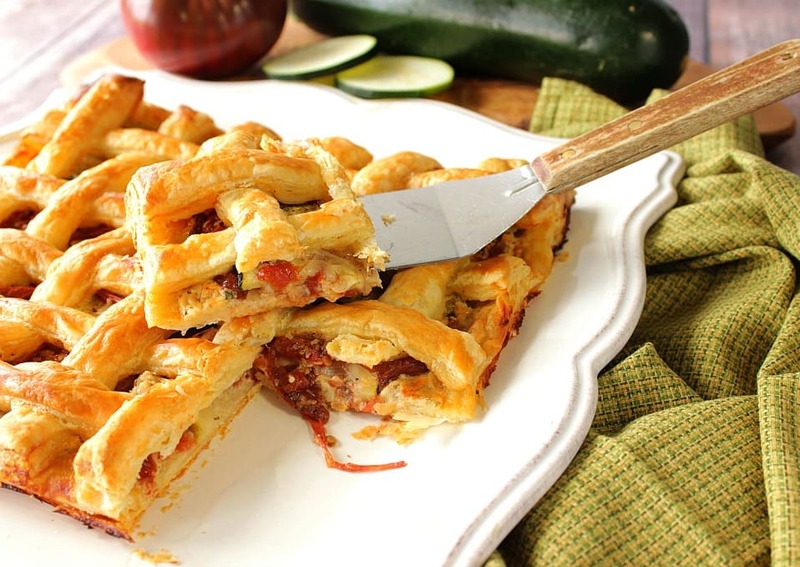 This easy to recreate flaky puff pastry tomato zucchini tart is a real showstopper! It’s a great way to showcase summer’s harvest of fresh tomatoes and zucchini. Store-bought puff pastry is truly a modern miracle for bakers everywhere. With a minimum effort and fuss, anyone can turn out impressive dishes or desserts that look like they belong in the front window of a bakery or French patisserie. I always like to keep a box or two of puff pastry at the ready in my freezer. My grocery store doesn’t always have it in stock (it’s a popular item), so when I see it, I like to grab a few boxes so I’ll have them on hand. And, with the holidays looming you can never go wrong with a small stockpile for any number of recipes, sweet or savory. To kick up the flavor of this flaky puff pastry tomato zucchini tart, I decided to add a creamy base of hummus mixed with Greek yogurt along with a packet of dry ranch seasoning. The Greek yogurt added a touch of tangy flavor to the hummus and ranch spread, making it a perfect compliment to the flavors of the tomatoes and zucchini, but stilled allowed them to remain the stars of the dish. In a medium bowl, stir together hummus, Greek yogurt and a packet of ranch dressing. Set aside while preparing the pastry. Thaw the pastry in the fridge for 1 hour before rolling. Gently roll one sheet of pastry (only slightly) on a sheet of parchment paper to remove fold lines and keep it as square as possible. Transfer the parchment paper with the dough to a baking sheet and continue. Place a generous amount (approximately 1¼ cups) of the prepared hummus spread in the center of the rolled dough. Spread the hummus evenly over the dough, leaving an approximate 1½” border around the entire edge. Prepare the tomatoes and zucchini by slicing them to a ¼” thickness. Layer the tomato and zucchini slices over the hummus spread, alternating the slices from tomato to zucchini. Season the vegetables with salt, pepper, olive oil, Parmesan cheese. Wet the border of the pastry with a bit of water. 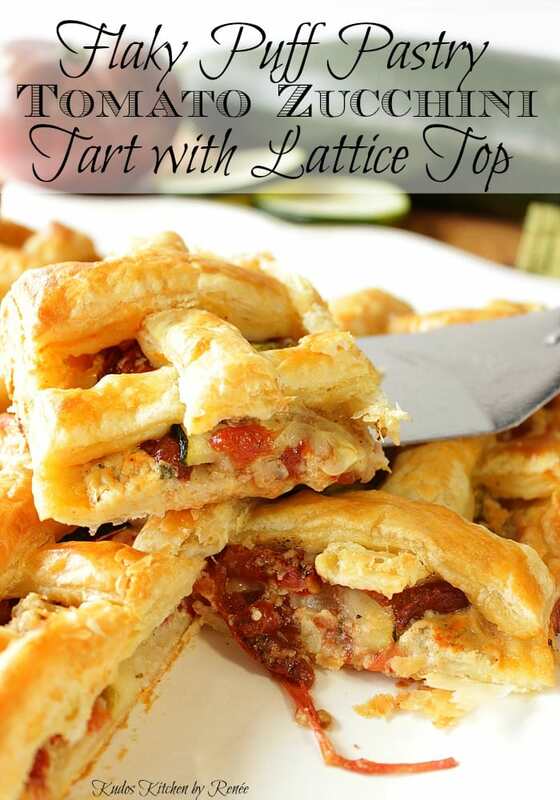 Set aside while preparing the lattice strips. Gently roll out the second sheet of thawed pastry dough to remove the fold seams, and keep it as square as possible. Use a pizza wheel of knife to cut the dough into twelve, ½” wide strips. Place six of the dough strips, evenly spaced, over the tomatoes and zucchini. Fold back strips 2, 4, and 6 slightly. Working with one of the remaining strips of dough at a time, lay it evenly (in the opposite direction) over one end of the tart and then fold strips 2, 4 and 6 back in place. For the next strip, fold back strips 1, 3, and 5 slightly and lay an additional remaining strip evenly over the tart and then replace strips 1, 3, and 5 back in place. Continue this alternating pattern until all the strips are used and an even lattice pattern (aka basket weave) pattern remains. Use the pizza cutter or a knife to evenly trim the edges of the pastry to make it as square as possible. Brush the lattice dough with an egg wash before baking. Bake in a preheated 350 degree oven for 50-60 minutes, or until the tart is puffed and golden. 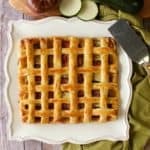 Allow the tart to cool completely and then use a cake lifter (or two spatulas, and a friend) to move the tart from the baking sheet to a serving platter. Slice and serve warm, or at room temperature. 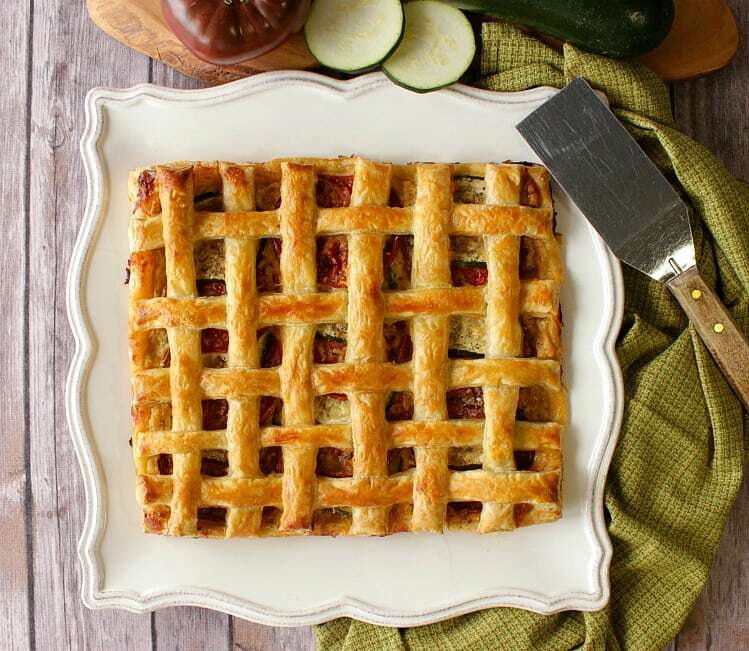 This easy to recreate flaky puff pastry tomato zucchini tart is a real showstopper! It's a great way to showcase summer's harvest of fresh tomatoes and zucchini. Mix together the hummus, Greek yogurt and ranch seasoning in a medium bowl. Set aside. Gently roll out one pastry sheet on parchment paper (to remove the fold seams) and roll into a square. Transfer the parchment paper and pastry to a baking sheet. Place approximately 1 cup of the hummus mixture in the center of the pastry and use an offset spatula or knife to spread the hummus evenly over the pastry, making sure to leave a 1½" border around all sides. Place the sliced tomato and zucchini over the hummus, alternating as you go. Season the tomatoes and zucchini a drizzle of olive oil, salt and pepper to taste, and sprinkle evenly with the Parmesan cheese. Wet the dough of the pastry border with a bit of water on all four sides. Set aside. Gently roll out the second pastry sheet (on parchment paper) to form a square. Use a pizza wheel to cut the rolled pastry into twelve even strips. Place 6 strips of the pastry evenly spaced over the tomato and zucchini slices. Use the pizza wheel to trim the excess pastry and make the edges even. In a small bowl use a fork to mix the egg and 1 tablespoon of water. Use a pastry brush to brush the egg wash over the lattice dough. Bake in a preheated 350 degree oven for 50-60 minutes or until the dough is puffed and golden. Allow the tart to cool completely and then use a couple of large spatulas or a cake lifter to remove the tart from the parchment paper and place it on a serving platter. Serve warm or at room temperature. Make extra of the hummus ranch dip to use for vegetables and crackers. It's delicious! The following AMAZON kitchen items coordinate in the making of this recipe, and are for your consideration. You have my word that you won’t be charged anything at all for clicking on the links. I’m coordinating this post with an apron I just completed today. It’s was a special order and the client ordered it for her sister who loves to cook with fresh herbs. 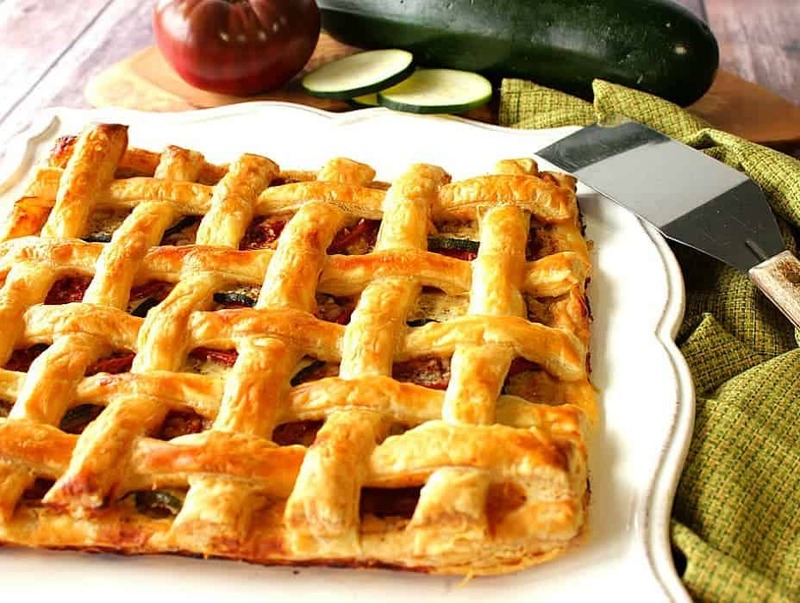 Even though my recipe for Flaky Puff Pastry Tomato Zucchini Tart with Lattice Top doesn’t call for fresh herbs, you can certainly add your favorites, if desired. The aprons I paint on are a high quality 65/35 cotton poly blend. Each apron has adjustable neck straps, extra long ties, and two large front pockets. 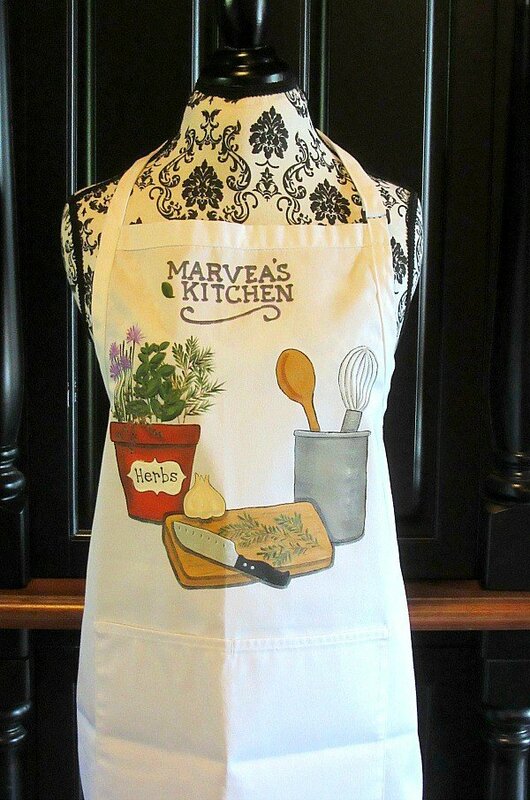 My hand painted aprons are completely machine washable and dryable (no fabric softener, please) and each apron is heat set for durability and long life of their vibrant colors. If there is ever anything I can paint for you, from fabrics (aprons, flour sack towels and book bags) to glassware items, please don’t hesitate to contact me with your special order requests: info@kudoskitchenbyrenee.com or visit one of my shops: Etsy, Wazala, and Kudos Kitchen Paints. Special orders are always welcome, and I will happily paint and design from any idea, photo or description you send my way (example shown). Kudos Kitchen by Renée ~ Where food, art, and fun collide each and every day! Until we eat again, I hope you have a delicious day! This looks so yummy! 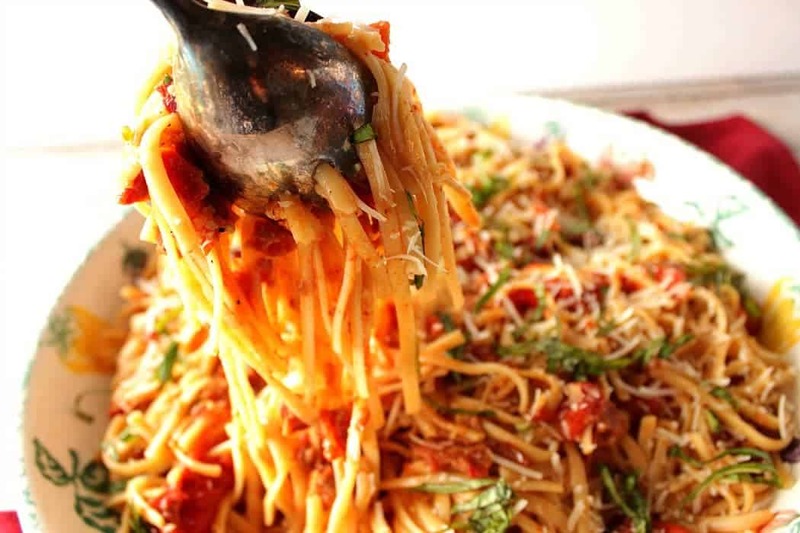 My teenage son loves to cook, so I’m hoping I can convince him to make this for us. 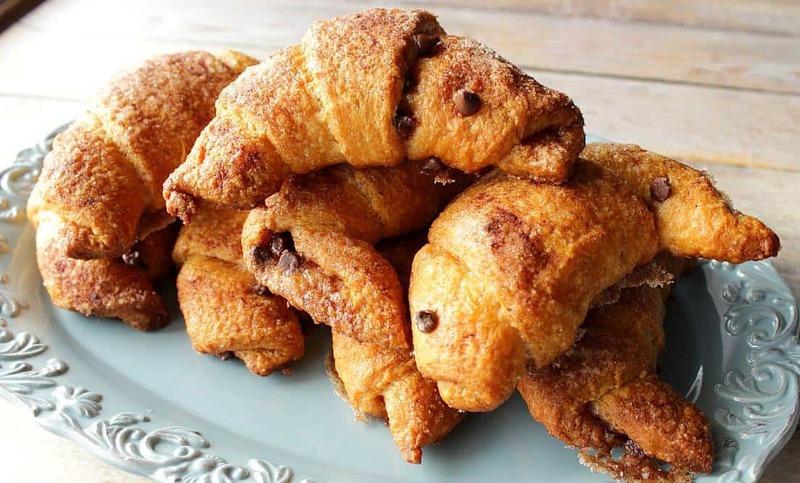 What a creative and delicious use for puff pastry!! Thank you so much, Amanda! Glad you like it. Oh my goodness!! This is absolutely incredible! I am definitely going to give it a try! I hope you do, Katerina. I know you’ll love it!